The Replace command can be used to search for a text string and replace it with another string. Replacements can be made selectively or globally, within the current file or across all edited files. Regular Expressions can be entered within the search string. This is the edit box where the search string is entered. When the Replace command is issued, the word beneath the text cursor is placed into the Find Text edit box, in case that word--or a word which is nearly the same--is to be the search string. To recall a search string which was previously entered, use the drop-down list or press the up or down arrow keys to review the items in the history list. Regular Expressions may be used within the search string. The Delete key can be used while the drop-down list is displayed to delete a selected entry from the history list. Special characters can be entered into the Find text edit box using the technique described in the Help topic Inserting Special Characters. This is the edit box where the replace string is entered. To recall a replace string which was previously entered, use the drop-down list or press the up or down arrow keys to review the items in the history list. The Replace command is line-oriented. It considers each line individually and does not look across line enders to match a search string which might span lines. Consequently, it is not possible to create new line enders using the Replace command, nor to delete existing line enders. For these types of operations, the Replace Line Enders command must be used. Use this button to insert a tab character into the Find Text or Replace with edit boxes. Ordinarily, the Tab key is used to move from field to field within a dialog box. If you would prefer that the Tab key insert a tab character in this dialog box, and in other Find/Replace related dialog boxes, check the relevant box on the Configure | Preferences | Tabs dialog page. 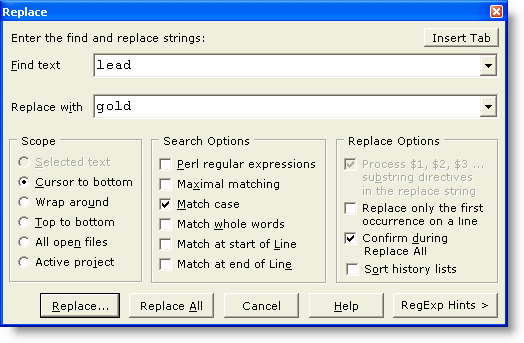 This option can be used to restrict the search and replace operation to the extent of the selected text. This option causes the search to be performed from the cursor onward, toward the end of file. When the end of file is reached, the search resumes at the top and continues to the original cursor position. This option causes the search and replace operation to be performed across all open files. Use this option to limit the scope of the Replace operation to those files within the active project. If this box is checked, wildcard characters within the search string will be interpreted according to the Perl-Compatible Regular Expression (PCRE) convention. In part, this means that the asterisk (*) will cause a match of zero or more occurrences of the preceding character. The period (.) will match any single character. For more information, see Regular Expressions. When using pattern matching characters, there can sometimes be more than one text string that matches the search string. This option can be used to request that the longest possible matching string be returned. This option can be used to force the search string to be matched exactly. When unchecked, a case insensitive search is performed. This option can be used to restrict matches to those strings which appear as a whole word. The characters which serve to delimit words are user-configurable; see Configure | Preferences | Cursor Travel. This option can be used to force the search string to be matched only when a matching string appears at the start of a line. This effect can also be achieved with a Regular Expression. This option can be used to force the search string to be matched only when a matching string appears at the end of a line. This effect can also be achieved with a Regular Expression. When this option is checked, special directives in the replace string will be replaced at match-time with subpatterns from the search string. This is a very powerful feature, as the following examples will illustrate. The search string will match a string of one or more word characters followed by a comma, followed by another string of one or more word characters. For example: Smith,John. The parentheses are used to define subpatterns. The first open parenthesis indicates subpattern number 1, the next number 2, and so on. In this way, the replace string can vary depending on what the search string matches. If the string Smith,John is matched, then the replace string will be John Smith. Running this search and replace operation on a data file would have the effect of inverting a list of Lastname,Firstname data to Firstname Lastname format. This search string will match either Boxer or BOXER. The replace string will be equal to whatever the string matched, surrounded by the HTML open-bold and close-bold sequences. In this way, the target word can be replaced without regard to its case, while ensuring that no case conversion occurs due to the replacement. The entire matching string is designated as $0, even if subpatterns are not used. Up to 100 subpatterns can be referenced, numbering from $0 to $99. References to named subpatterns such as (?P=name) are also recognized in the replace string. See the Regular Expressions topic for more information about named subpatterns. When this option is checked, only the first matching instance on a line will be considered eligible for replacement. When this option is selected the Replace All operation will prompt before making each replacement. A dialog box will be presented so that each replacement can be confirmed. From this confirmation dialog box it is possible to later opt for unconditional replacements, by selecting its All button. If this box is checked the search and replace history lists will be maintained in alphabetic order, rather than in the order the strings were entered. When switching to alphabetically sorted lists, the chronological ordering of the lists will be lost, and cannot be restored by unchecking the checkbox. No attempt is made to associate the history list entries with the time that they were added to the list. If a sorted history list is used consistently, over time the list will come to hold an unrepresentative set of search phrases. In the extreme case, after many Replace operations, a list could result that contained only phrases beginning with the letter 'A'. This occurs because entries at the bottom of the list will be removed after the maximum size of the list is reached.